What’s up with the pond at Haverford College? Concerns that development might be underway and affect the critters that inhabit the Haverford College Duck Pond has prompted an outpouring of concern among neighbors, joggers and dog walkers along the Main Line. “What the heck is going on at Haverford college and the pond!” Kim Mazzenga posted on the Suburban Dog Talk Facebook page. Nothing nefarious. 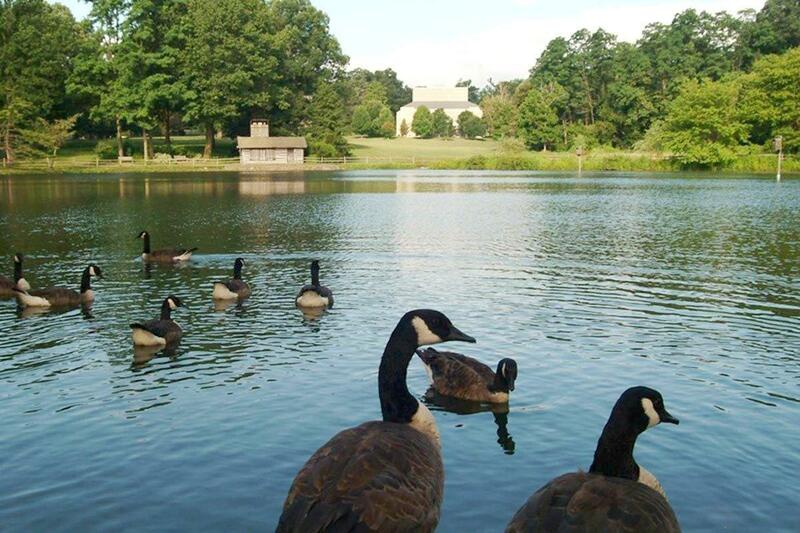 The college is actually restoring the iconic pond – the larger of two on the campus. “Parts of the pond have gotten as shallow as 12 inches,” said Chris Mills, director of communications. It has been 27 years since the pond was last cleaned out. Silt has accumulated and was beginning to pose a threat to the ecosystem. The goal is to dredge out the muck and return the pond to its optimum depth of 5 to 7 feet. The project is expected to be complete by early to mid August, although the rate of water refill on the pond will be up to Mother Nature, Mills said. The college enlisted a wildlife removal firm to re-locate about 70 fish, turtles and frogs — at least those that were cooperative and could be found. The native fish including large mouth bass, pumpkin seed sunfish, and catfish were relocated to the upper pond or other area waterways such as the Darby Creek. Twelve snapping turtles are spending the summer in the college’s smaller upper pond. Wildlife officials are keeping an eye out for any smaller turtles that might wander into the pond area from the surrounding marshlands. Once the pond is ready, the native fish and other species will be reintroduced. The college found home for most of the non-native koi and goldfish that had called the pond home. About 10 koi were euthanized after it was discovered they were diseased. Non-native and invasive red-eared slider turtles also were removed from the pond and euthanized. It is illegal to release this species into the state’s waterways, according to the Game Commission. The species, which were a common in pet stores in the 1960s and 1970s, compete with native turtles for food and habitat areas. “Please don’t relocate that red-eared slider to another pond. They are invasive and push out our native turtles!” Theresa McLaughlin said on Facebook after a suggestion was made by readers to transport the aggressive turtle to ponds in other municipalities. The 6,000-7,000 cubic yards of soil will be placed on an adjacent field between the pond and Lancaster Ave., where it will be covered with sod. That job will be completed in time for the fall semester and for the college’s championship Ultimate Frisbee team to take the field, Mills said. This isn’t the first time the college has taken steps to clean waterways that flow through the campus. “Two years ago we began a restoration of the creek that is downstream form the pond dam,” Mills said. The creek was overgrown and there was “significant erosion” of the creek bed. Goats were enlisted for the first stage of that project —clearing brush. “We consider our campus a treasure and take seriously our responsibility to care for it,” Mills stated.